Starboard Hypernut 7'2 x 28" wiil it be good for kid's ? for first wave sup ? 10 and 14 years old. Personally, I think something longer with more glide (but not too much volume) would be a better first wave board for kids. E.g. catching waves on my Hypernut takes a lot more skill than on my 9'0 longboard style SUP. And when a board is sub 8', your kids would need to deal with front to back instability in the chop in addition to side to side. It could be OK if you have athletic light boys with surfing experience. Otherwise, you should use longer boards. I have seen with my daughters that their wave count drastically decreased on boards less than ~ 8'6". On the gentle waves they were on, a ~ 9' longboard SUP front part was on the water and helping them takeoff even if their body placement was not perfect. On a 7'7" board, something was missing, they lost the wave. 28" should be OK. wider will be stabler but will add more row due to the paddle angle. 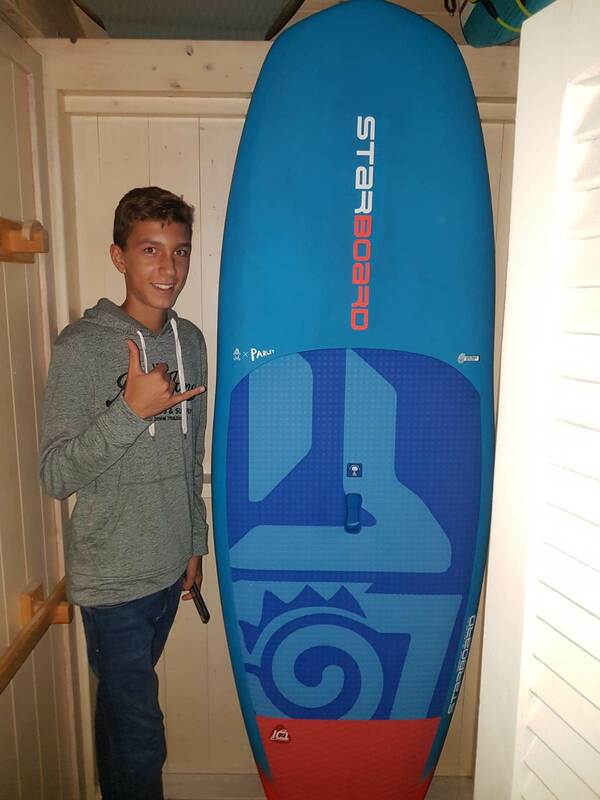 This summer I bought my son's first board that was a Gong 7.6x31 MOB x 120 lt. Good price and nice look and very suitable for the short and messy italian conditions. My first son has 14 and he is very tall and bone and skin. With this board, starting almost from zero in wave riding, in a couple of months he follows me in every wave (max chest-head high). The right board has created a little avid supper. Some weeks ago I sold the Gong and I bought an amazing Hyper Nut carbon 2018 7.8x30 x 115 lt. Despite the 5 lt less it's more easy to use. With this short and large board the boy is able to catch and manage every wave because it's stable and turns quikly. Also my second one son (11yo) was able to catch little waves in very few times. About the Hyper Nut the deck is flat and the overall quality is incomparable, also the price.... A short board for kids is easier to manage in and out of water. Also for the father. My son is more than 1.80 and weights 60kg circa. A little bigger board it's easier at the beginning. Dont't waste time and passion in too much demanding board for yours sons.